Pest Management book from C.H.I.P.S. Exotic Pests and Diseases emphasizes the importance of policy measures to protect against the introduction and spread of exotic pests and diseases and provides needed analysis of the policies on this important topic. 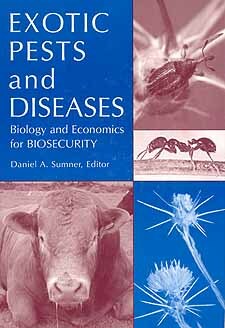 Exotic Pests and Diseases combines biological foundations and implications for the public good, providing powerful insights on a series of public policy issues of national and international importance.